dived into them pretty eagerly. And they were terrible. Over the course of a thousand pages, Willis seemed to have almost no interest in building any kind of engaging narrative at all; the characters behaved throughout like scared high school students (in the end, the exception turns out to be the only character who is a high school student); arbitrary coincidences and artificial secrecy were jammed in repeatedly to keep the plot from falling apart completely; and the resolution of the main time travel story was almost nonexistent. I repeatedly felt like throwing the book at the wall in frustration and giving up entirely on it. In other words, it was a mess. 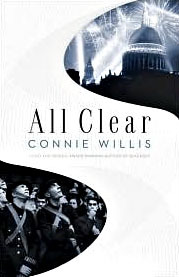 Willis’s real goal seemed less to tell a story than to exhibit her encyclopedic knowledge of British life during the Blitz. This would have been fine if her storytelling had genuinely conveyed a sense of what it was like to live during that period, but it never really did. So even that fell through. There was, however, one rewarding aspect of making it to the end. My most common complaint with modern novels is that they’re usually extremely well crafted — often elegantly so — but the authors simply can’t create an ending to match the buildup. I don’t know why. But Blackout/All Clear was exactly the opposite, and I can’t remember the last time that happened to me. I was continuously annoyed with the novel from about page 300 on, but that annoyance stopped during the final hundred pages or so. The ending of Blackout/All Clear was terrific. It was, in the end, a story about the power of family and upbringing, and that story was both affecting and powerful. Did that make the previous 900 pages worth it? No. But it erased some of the sting. As for the rest of the Nebula nominees, I haven’t read any of them, and four of the authors I’ve never read anything by. I just hardly read any science fiction these days, and I’m not sure why. I don’t think there’s anything wrong with sf itself, since lots of people still like the current output, but I’m disappointed almost every time I pick something up. Last year the only sf I read was a couple of books by China Miéville, both highly recommended, but neither one did anything for me. I actively disliked Perdido Street Station and was only mildly interested in The City and the City. I’ve morphed into an almost pure nonfiction reader these days. I don’t like this much, but I’m not sure what to do about it. 1Speaking of this, what do you call a two-part novel? A diptych? A duology? There’s no equivalent to trilogy or tetralogy, is there? So what’s the accepted term of art?